2016 Zero DSR. Picture credits - Zero. Submit more pictures. 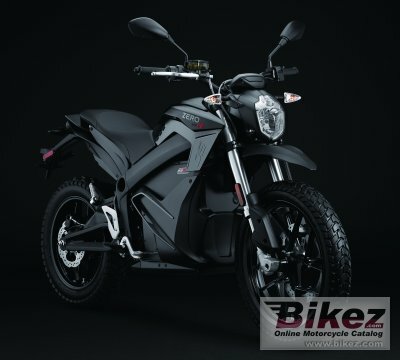 The Zero DSR is an amped-up version of the Zero DS, bringing unprecedented levels of power and torque to the world�s most versatile electric motorcycle. For the dual sport rider demanding more, the Zero DSR delivers 56% more torque and 25% more power. A 660 amp controller is paired with a Z-Force� motor that contains higher temperature magnets to ensure better performance during extended durations at higher speeds. Comments: Range up to 185 miles. 8 hour charging, 110 or 220 Volt. Lithium Ion 12.5 kWh battery. Various battery options called ZF13.0, and ZF13.0 + Power Tank. Ask questions Join the 16 Zero DSR discussion group or the general Zero discussion group. Bikez has reestablished Bikez.info motorcycle web shop overview. Here we present the major online shopping possibilities for motorcycle parts, gear and accessories. This includes customizing and insurance. Search and compare products and prices. Try our 2016 Zero DSR discussion forum if you have questions or comments. Information about any technical issue is always welcome.